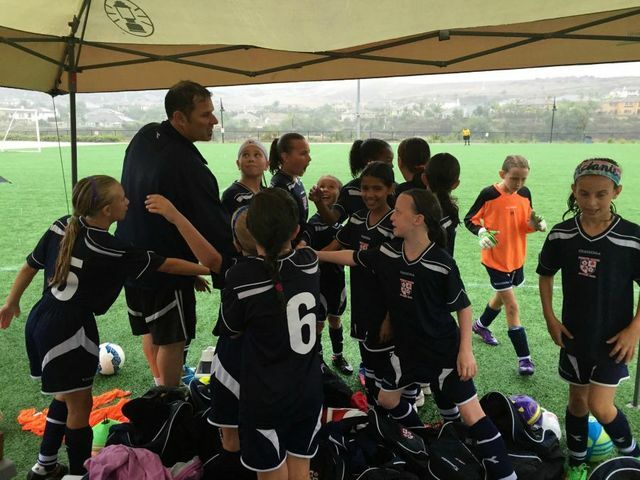 Melanie was a substitute for her old team (Scripps Ranch Girls U-11 White) at their tournament this weekend. "Lucky" for everyone, this weekend saw some of the worst summer storms we've ever had. Her match started with a warning from the referee that "If I can't count to 10 between the lightning and the thunder, I'm calling the game." Chris, I'm not sure that umbrella is doing as much good as you think it might be doing. Just a few minutes into the match, with several counts from one to ten between lightning and thunder, the organizer suspended the tournament. As we all gathered our stuff to leave, Melanie realized that the referee had walked off with her ball as it was being used in the game. So we went after him and got the ball back. As we stepped back on to the field (artificial turf) it seemed as if flashbulbs went off in front of us and then screaming kids and frantic parents started running towards us. 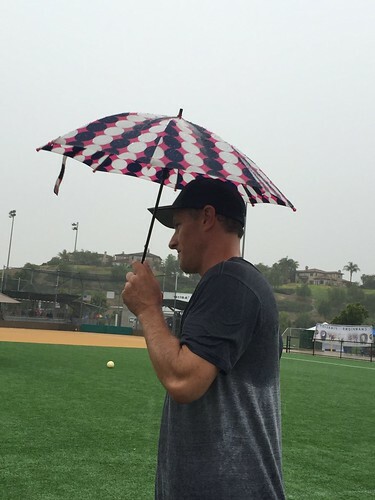 Lightning had hit the pop-up tent that was sheltering the team. No one was hurt, though there were a few burn marks on arms that were holding the tent or a nearby umbrella. But needless to say, that was it for the day. Yesterday was better. Rain, but no thunder and lightning. The tournament was able to make up games, and Melanie played well. She even volleyed a goal kick right back at goal. It was a spectacular effort that sadly went just wide.